Here are five things to do when a team’s diverse makeup causes more strife than benefit. You don’t have to travel too far down an Internet rabbit hole to happen upon a claim that diversity is a good thing for teams and organizations. Research has shown that diversity of thought or perspective can increase creativity, improve problem-solving and decision-making, and ultimately benefit the bottom line. But knowing the potential benefits of diversity is one thing; actually reaping those benefits on your own team can be something else entirely. Suppose your team doesn’t have a lot of diversity. What do you do then? 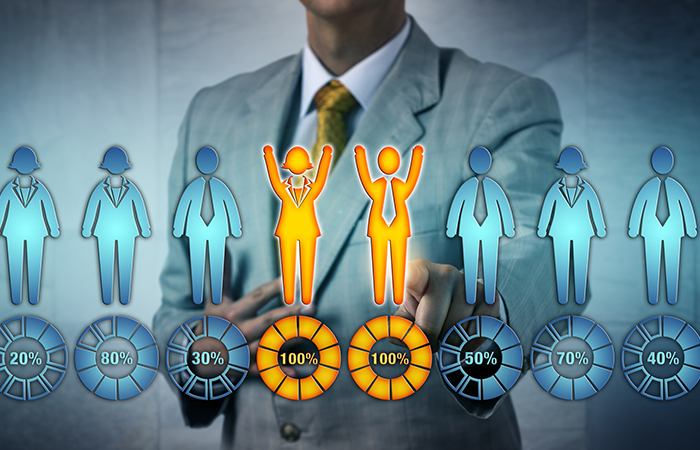 Teams can become quite homogenous when particular functions attract or select a certain type of person with a shared perspective, like a finance department hiring those who favor a concrete, quantitative approach, for example. Or, lack of diversity can result from teams and organizations selecting members based on cultural “fit”and adding new people who are a lot like those already there. Or suppose you do have diversity, but instead of being beneficial, people seem to be having difficulty seeing eye-to-eye. The presence of diversity doesn’t always lead to positive outcomes when people’s preferences and needs conflict. Suppose some people on your team prefer directness and others diplomacy, or some prioritize practicality and others creativity. How can you benefit from diversity like that instead of being hindered by it? Start by taking measure of your current team and its composition. In what areas do you have diversity and in where is it lacking? Do team members embrace risk or avoid it? Trust intuition or facts? Prioritize discipline or flexibility? Next, delineate your team’s strengths and weaknesses and review what kinds of mistakes your team tends to make. Then ask yourself whether or how diversity, or lack thereof, is playing into your team’s performance. For example, might your failure to keep up with the competition stem from having too many team members who deliberate on decisions for too long? Are ruffled feathers among stakeholders arising from a predominance of individuals who prioritize results over people? If your team lacks diversity in key areas, or has some problematic weaknesses, consider selecting for diversity next time you add a team member; choose someone with a perspective others lack. Or, if adding diversity to your team isn’t possible, borrow it. Say you have a key customer counting on you to create a detailed implementation plan, but your team is full of big picture people. Borrow a detail-focused colleague from another team to provide guidance and answer key questions. Are you including the right level of detail in your plan? What steps have you missed? What flaws aren’t you seeing? Adding or borrowing diversity isn’t always an option, but if you’re clear on what relevant perspectives you’re missing or what your weaknesses are, you might be able to fake it. Ask people to put themselves in the shoes of those perspectives not represented on your team and “think like” the missing type. This technique is similar to playing devil’s advocate, but instead you’ll advocate for a detailed perspective, or a risk-embracing one, or a relationship-focused one–whatever relevant perspective your team is missing. The presence of diverse perspectives won’t help you much if your team working norms support only the dominant perspectives. Let’s say you’ve attempted to balance a hard-driving, competitive, goal-focused team with someone who has strong relationship-building skills, but the team continues to take a win-at-all-costs approach to things. Your relationship-builder doesn’t have much hope of success. Ask yourself whether your team works in a way that can support preferences for both challenge and connection; flexibility and discipline; creativity and practicality. If the questions you’ve asked have revealed ways that your team’s approach supports some perspectives more than others, consider making some adjustments. One way to satisfy the needs of one perspective without turning others off is to offer options. For example, some people prefer to prepare for meetings in advance, while others feel burdened by such expectations. Meet the needs of both types by providing pre-work before a meeting but make it optional. When it comes to team success, it seems that everyone is looking for a silver bullet, and diversity isn’t that. But the thing with silver bullets is, you’ve either got one at the moment you need it, or you don’t. Diversity is a more complex solution to the challenges your team faces, and it requires a more nuanced approach, but it’s more flexible too. So, unless your team is ambushed by an actual werewolf, you’ll likely to benefit from trying to make diversity work for you. David A. Thaeler used the Great Recession as an opportunity to help transform the culture, strategy and operations of Haskell. LinkedIn announced new enhancements to its recruiting products and the impending rollout of a new ATS at its annual conference.